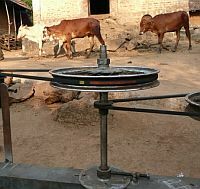 Arjun Sarwal has just made a short video about his Cow Power Dynamo to generate electricity for the Khairat village school pilot of OLPC India. Our approach was to not look from a motor/dynamo etc. point of view. Our approach was to develop power solutions around locally available mechanisms. At the village (pilot site near Mumbai) we explored the ideas of using solar power (in Mumbai sunlight is not consistently strong) , running water (we couldn't find any local water bodies nearby), wind power (no wind in the that area), mounting small dynamos on bicycles (we found out that in that area bicycles aren't that common at all, esp in that village) ....but the village had an abundance of cattle - that were being used in the fields. So we decided to design something around that. And you have to hand it to him. The Cow Power Dynamo, built from old Fiat parts and a few belts and pulleys, is an amazing example of local innovation that we should all celebrate. Excellent ! Superb ! Magnificent ! And so on. And I bet he got a lot of the necessary knowledge by reading a book or two . . .
Will this be shipping with the G1G1 laptops? Arjun Sarwal along with the Mumbai team made some good progress on the cow-power system for charging the XO. They made some changes in the electrical design (e.g., using an alternator now instead of a dynamo) and they have a plan regarding the mechanical design based upon a better understanding of what are readily available parts. The current setup easily charges two laptops, however with the planned mechanical design changes, they hope to charge at least ten laptops simultaneously. Beautiful! It's times like this when I suddenly believe there is hope for the world, after all! Basically as children play on a merry-go-round, they power a pumping system that moves water into a storage tank. The kids are doing something they would do anyway, and there's a benefit to the village as a whole. I was thinking that it might be possible to put the same idea to work with an electrical generator. The kids play on the merry go round, and the rotation turns a generator's rotor, generating electricity. The electricity is stored in batteries and used at night. Of course there's nothing that says this idea can't work in more developed nations as well. Putting a small generator on school playgrounds that provides power to the air conditioner might be a good thing. you have done a marvellous job for poor families. I am also interested in developing an electrical item through which a battery of 12 volt can be charged.